Walking along city streets, it is easy to find cafes full of students studying. In the past, most students went to crowded but quiet libraries to study, but today, more and more students prefer to study at cafes. Indeed, cafes are not as quiet as libraries, but they are considered ideal study places. Cafes allow students to study in a comfortable environment under the sounds of soft music and people chatting in the background. Because food and drinks are readily available, there is a comparatively freer atmosphere than at libraries. Studying in cafes has it benefits, and after experiencing both studying at a library and at a cafe, this SMT reporter recommends a cafe. First, the noise level is not a distraction. Libraries are, of course, quitter, but whenever there is any noise, it can seem louder than the noise at a cafe due to the silence. This noise can often be more distracting and make it even more difficult to concentrate on your work. In addition, students have to make a constant effort not to make any noise at a library, which keeps them from concentrating. Contrarily, cafes are places to socialize, so students may discuss or question others during their study. Also, the dropping of a pen or eraser will not distract or be of a nuisance to others because no one is likely to even notice. Moreover, students are free to purchase drinks and food at cafes, so studying can be continued without the need to leave one’s seat in order to eat or drink something. It also provides a means of taking a break from studying. For these benefits, cafes have become popular places at which to study. While the benefits are great, there is a negative side to studying at cafes. As mentioned earlier, cafes are places meant for socializing. Hence, with so many people studying, they may actually be disturbing other customers. Other customers could feel the need to speak more quietly, and because people studying generally stay and occupy seats for great lengths of time, other customers may be unable to find a spot to sit. Students are then causing harm not only to other paying customers, but also to cafe owners as well, who lose income. For a cafe to earn profit, there must be a certain amount of circulation among customers, but students who study in cafes prohibit this from happening. While some students may be purchasing enough products from the cafe to warrant their time there, this reporter has witnessed cases of students only purchasing a single cup of coffee and occupying a seat for 4 hours or more. Over time, trends fade as new cultures settle in. During the process of establishing new rules and accepting new ideas, there will always be conflicts. There are good reasons for wanting to study at cafes and also for some people to disapprove of it, but everyone must learn to understand each other and make adjustments until an equilibrium state is established. 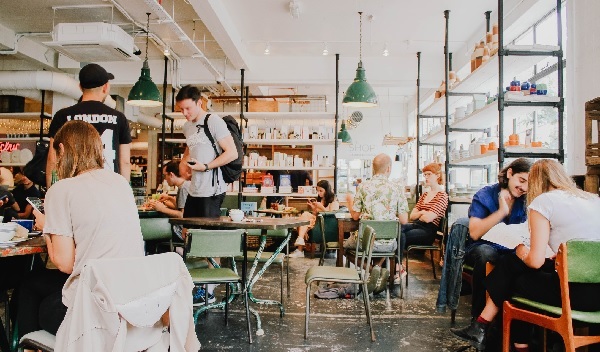 Students need to balance their own needs and consideration of others who are using the same space so that all, students, other patrons, and cafe owners, can have smiles on their faces.